The Kat House — KRAZY FOR KATS, INC.
Who would not want to be rescued from the dangerous streets of LA to come and live at the Kat House! It is the perfect place for new kittens to get adjusted to people and to be around other cats! In the afternoons, you will find the kitties outside on the “enclosed deck” nestled high in the trees. It has three climbing posts and is great for catching bugs and watching the elusive hummingbird! There is a kitty door for easy access to the litter box and to go in and out as needed for weather conditions. We also provide separate “socializing” areas for feral kittens that need some extra time to bond with humans. These cages are big enough for a kitty condo, bed and litter box. Cats like smaller places to go into for safety when they first arrive at the Kat House. Often we have bottle babies and very young kittens to take care in our rescue work. These precious babies are separated from the other cats for the first month and during bottle-feeding. CHILLI' OUT WITH MY KITTY FRIENDS AT THE KAT HOUSE! OUR KITTIES LOVE THE PUPS! When they are about 4 weeks old, they are moved to their own “baby” bathroom so that they can run around freely. Each kitten is very closely monitored during their growth and we keep a detailed chart on their progress and medical check-ups. Young kittens are weighed each day to ensure proper growth and they are placed on the highest quality kitten formula. 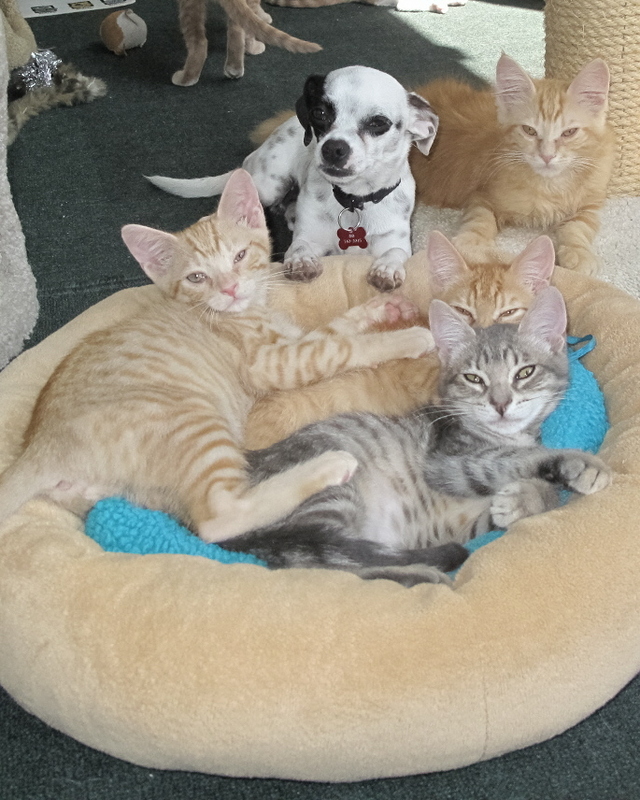 These babies have a covered bed with a heating pad, litter box for training and lots of toys to play all day long! After they have had all of their medical work done and they are about 3 months old, they are ready for adoption to their new forever homes.